Everybody has quirks. Every thing has quirks. And nearly three months (!) 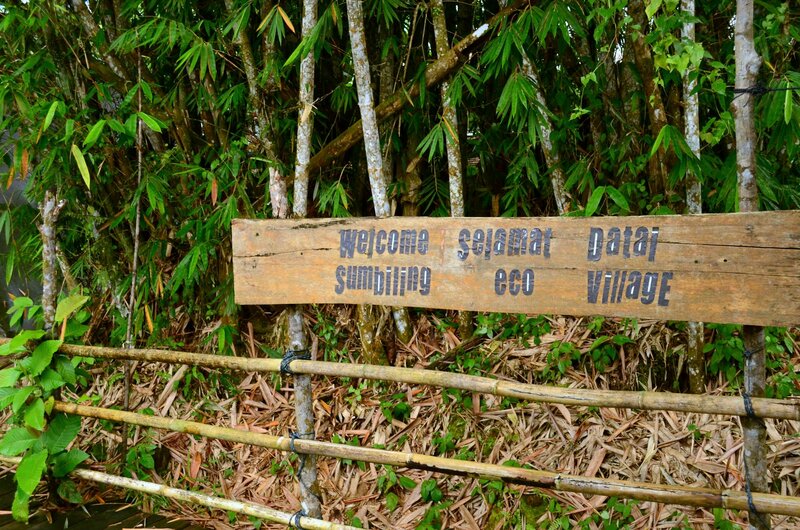 into my time in Brunei, we’ve discovered some of the little quirks of this place. These are those really little things that don’t really make a big difference in our daily life, but every so often make us go “huh! that’s odd”. Chips (as in hot chips, french fries) usually don’t come with salt. And there often isn’t salt on the tables. So you have to specially request it. Cash machines are always in air conditioned rooms, and there are separate machines for cash withdrawal and cash deposit. And people actually use the deposit machines (at least sometimes). People rent bouncy castles. This is an odd one, I know. But in all my years in New Zealand, I don’t think I’ve ever seen a bouncy castle in someone’s backyard. 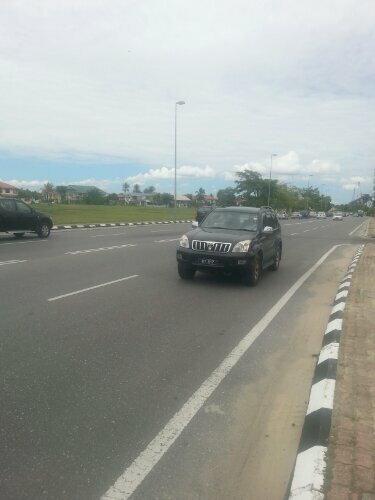 In three months in Brunei, I’ve seen at least four. There is so much beach, but nobody swims. The water doesn’t always look the best, but it’s usually fine. And it’s lovely and warm (but still cooler than outside). Yet no one else is ever swimming! The weekend for many people is split. They work Monday-Thursday and Saturday, with Fridays and Sundays off. Some people drive really fast and a little bit nutty. Other people drive really slow (some trucks are limited to 35 km/h, others to 50 or 60 km/h). But no one seems too bothered by the other. People are seriously addicted to smart phones. It’s really common to see a large family out for dinner, with everyone tapping away on phones and no one talking. There are no rules about lighting fires (as far as we can tell), and you often see people burning rubbish in their gardens, even in town. All number plates begin with K or B, depending where the car was registered. Carrot juice is often served with milk. 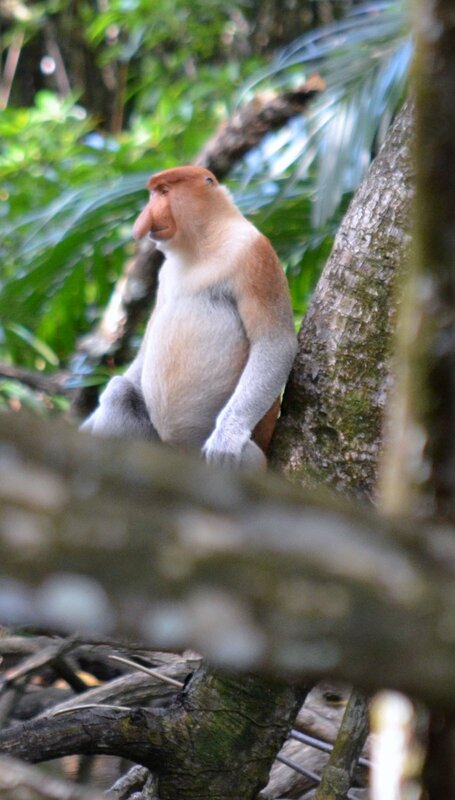 Another quirky thing: a proboscis monkey! Photo by The Engineer. 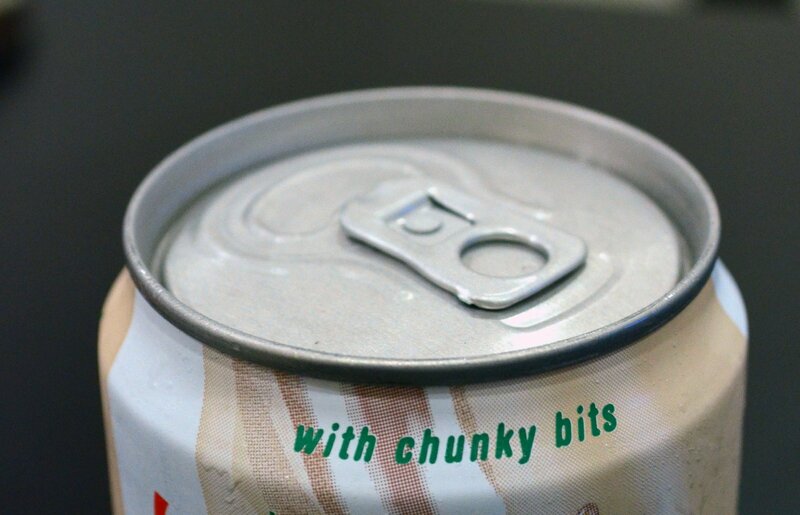 The main advertising point of this one was that it contained chunky bits, which is not entirely positive in our eyes. But the drink was not terrible. It basically tasted like sweet water with some chunky bits. Very sweet water, if we’re honest about it. It tasted a bit like Grass Jelly Drink (which we had tried at a Hash Running event – not by choice), which was not surprising, but also not a great selling point. To be honest, I’m not sure why I included this one in the challenge. 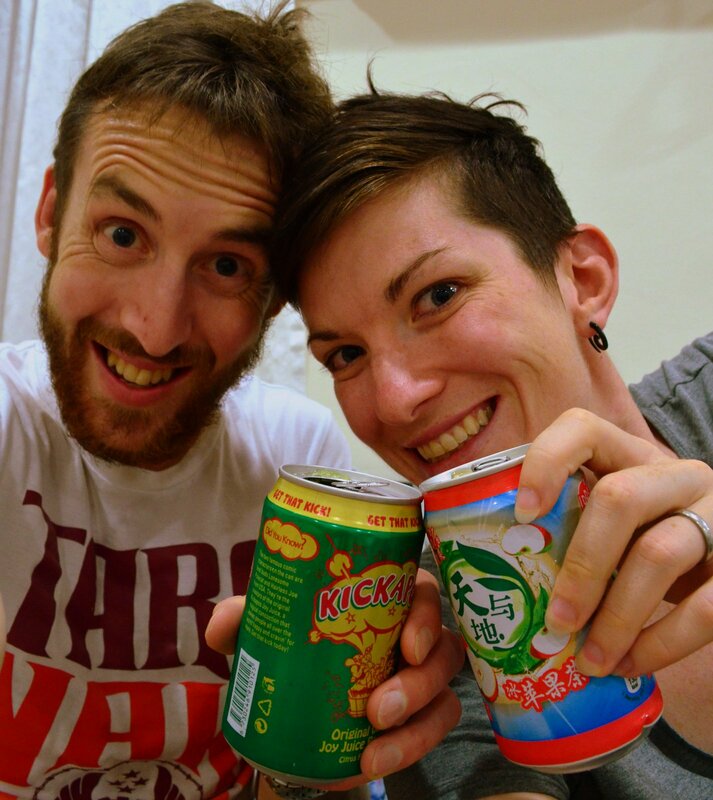 We’ve both tried plenty of soy milk before, and while we don’t hate it, it’s not exactly something we drink straight for pleasure. Nevertheless, it was included in the challenge, so it had to be tried. And turns out this wasn’t just any regular soy milk. It was soy milk with about 10 teaspoons of sugar added. We shouldn’t have been too surprised; drinks here are always pretty sugary and we tend to order many things with little sugar or no sugar. But surprised we were, and not in a good way. We intentionally saved what we thought would be the best for last. So the second to last was the Apple Tea. And we were right to save this one. It tasted a bit like apple juice, but less sweet, and with a slight taste of black tea. That sounds a little bit weird when I write it, but we both really liked it. I liked it so much that I tried another can for lunch the next day, but either my tastebuds were a bit messed up when I tried it the first time, or this was a different batch. It was still drinkable, but quite ‘fake’ tasting. Nonetheless, it’s inspired me to make home made iced tea! The description of this one was ‘Citrus Flavoured Soft Drink’, which is pretty much The Engineer’s favourite thing. To be honest, it was only really included in the challenge for the name (seriously guys, Kickapoo Joy Juice?!). And all assumptions about this one were correct. He loved it. It tasted a little bit like Mountain Dew, but less insanely yellow, and less insanely sweet. Reading the label, we even found out that it was made in Brunei. And nothing is really made in Brunei, so that’s impressive! All in all, this one was a big ol’ win. This post is the start of a new series. I love books, I am an expat. So, I am going to start writing about the books I read that are related to being an expat. (Note: I write a tiny bit about the other books I read over at Goodreads). This series is supported (in part) by Summertime Publishing, who have very kindly offered me review copies of some of their books (their books are by and for expats, and you can buy them at Expat Bookshop). Sunshine Soup is the story of a group of expat women in Dubai who are trying to travel through the culture shock, loss of identity, and depression so often associated with an overseas move. The story starts with Maya, a newcomer who misses her friends, her delicatessen and her kitchen. When she gets the stamp in her passport saying “Wife – Not Allowed to Work”, she is shocked, and has to rediscover her identity without the business she built and loved back at home. Early on she meets Barb, a ‘super expat wife’ who is so busy volunteering, meeting and helping that she neglects herself and has never really dealt with past grief. A number of other women with different experiences and reasons for being in Dubai come into the scene, and we meet many of the ‘typical’ types of expats. But while the main characters may be ‘typical’ in some ways, they are not caricatures, or one dimensional. The characters are layered and interesting, and definitely draw you into the story. This is also helped by the fact that the book starts at just the right point. The story starts where the action starts, and the background is woven in throughout, making it a far more interesting read. I was into the story from the start, and wanted to find out what happened. 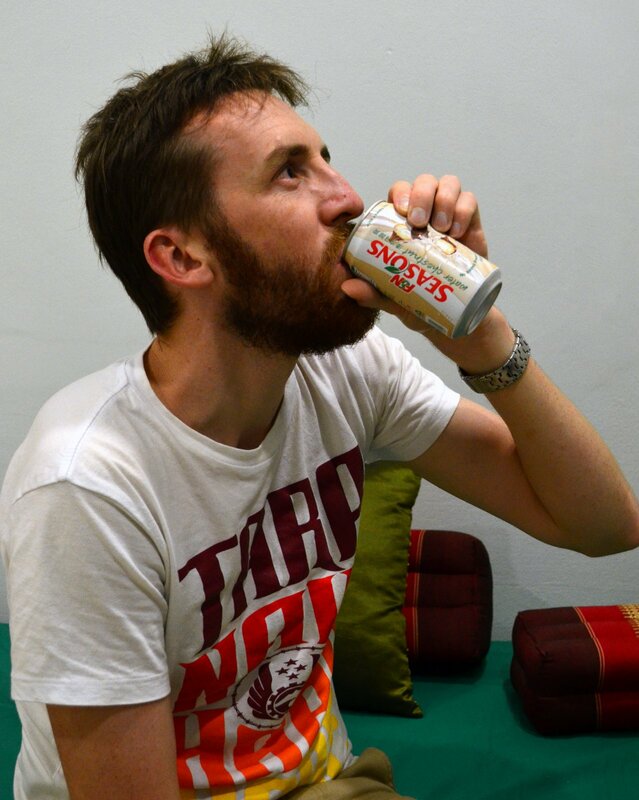 Sunshine Soup really nails an often ignored expat life. That it’s just ordinary life, but in another country. It’s so easy to glamourise this life (after all, staying in a lovely sunny climate, with lots of new experiences and travels, and often a fairly lavish lifestyle is pretty easy to glamourise). But the reality is that ordinary things still happen. People grieve, people are tempted, people are sullen, work is hard sometimes, teenagers are teenagers. And this book captures all of that reality throughout. However, at the end, I lost the plot a little (no, I didn’t go crazy, I just wasn’t quite so engaged with the story). I think the end was a little rushed, and a few storylines were a bit out of the blue for me (particularly Barb’s love interest). I also thought that the connection with food was a little bit forced. There were times where it fitted in seamlessly (and made me really hungry), but other times where I felt like the story was being pushed in slightly unnatural directions. Overall, I think that this book would be particularly great for anyone about to head on their first expat adventure, as well as anyone who has already been through the experience. There are plenty of characters and experiences to relate to. And I love to engage with life experiences through fiction. I far prefer this format to a memoir, where the constraints of reality can so easily be detrimental to the plot (that is not to say there aren’t great memoirs out there, and I even intend to review some here, but in general I’m a fiction girl). Sunshine Soup is a great read, and will resonate particularly strongly with global souls. But the writing and story is accessible enough that anyone could enjoy it, whether they see themselves as a global soul/trailing spouse/expat/traveller or not. 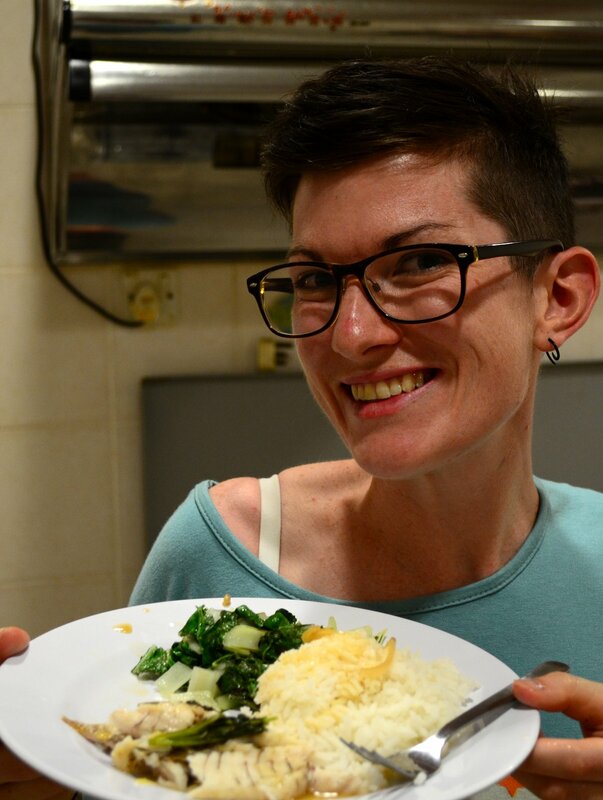 When I arrived in Brunei, one of the first restaurants we went to was WYWY in Seria. It was a hot day, we were tired, and the place didn’t look too daunting… Well, it didn’t look too daunting until we got our menus. They were the fattest menus I’d ever seen. 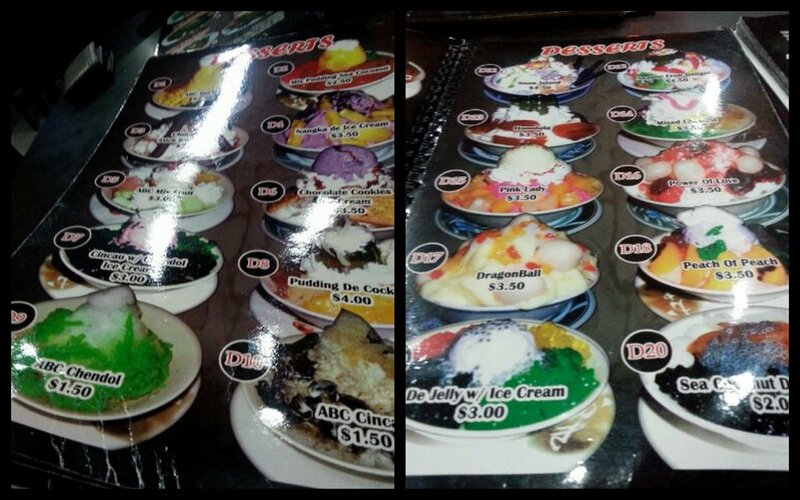 So fat that the waitress couldn’t carry more than four at a time, and so fat that they required a contents page. We were just there for lunch at the time, and the food was underwhelming (The Engineer’s prawns were way overcooked, my squid stirfry was edible but boring). 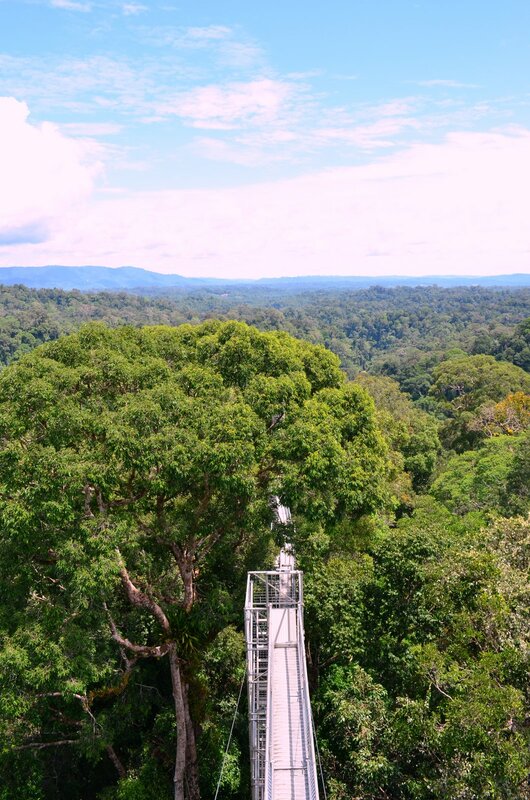 But the desserts pages stuck in our minds, and this week when we had not completed our challenge by Sunday evening, had no food in the fridge, and were exhausted after a trip to the jungle, we decided that this was the time to revisit them. The challenge was for each of us to order dessert for the other. Pretty simple, but with so much potential for greatness. Deliberation took quite some time (there are more than 50 dessert options). I was tossing up between ABC, Cherry ABC, and ABC Fresh Coconut for The Engineer. And trying to convince him that Peach of Peach was by far the best choice for me. There was a bit of confusion about our dessert orders. We had several different people offering menus, taking orders, clearing tables, ignoring our not-so-subtle stares, and dragging our time in the restaurant out for as long as possible. But eventually, our desserts arrived. 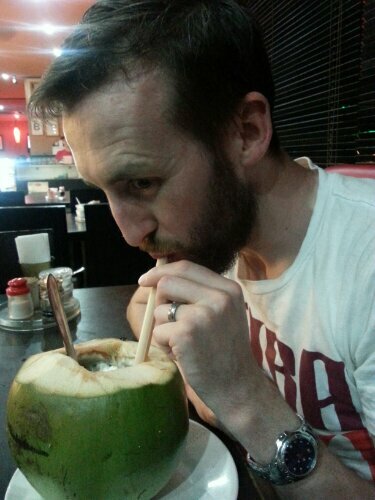 The coconut arrived, and didn’t look too scary. 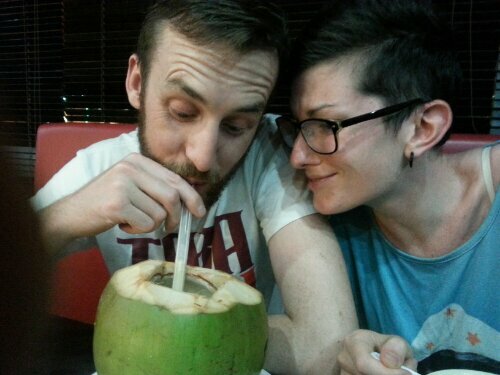 There was coconut water on the side (which he promptly gave to me – he’s not a fan), and the coconut had been filled, but all you could see was whipped cream, and the big ol’ straw sticking out. 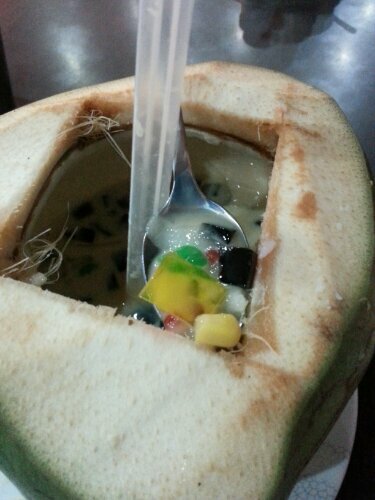 ABC Fresh Coconut. Looks pretty harmless, doesn’t it? What’s inside the ABC Fresh Coconut? It was basically milk based, with plenty of ice. Thrown in were lots of other bits. Some Chendol (the green wormy looking jelly), some Cincau (the Grass Jelly), some red jelly drops, some yellow jelly, and some sweet corn. Individually, nothing was bad. But the combo left a lot to be desired. For me, The Engineer selected Mixed Chendol. He’d been curious about Chendol for a while (and we didn’t realise it was included in the ABC). 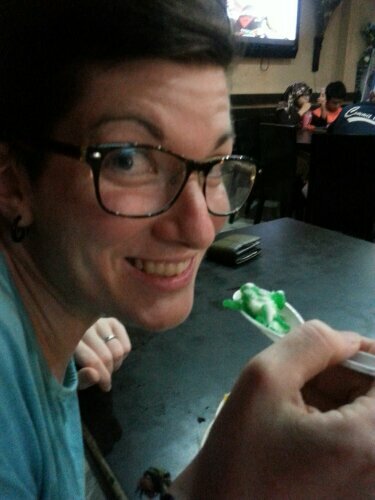 The bright green worms of jelly are pretty weird looking after all. My Mixed Chendol. I like the colours! And when it arrived, so did my relief. It was basically jelly and ice cream (the ice cream is coated in whipped cream). 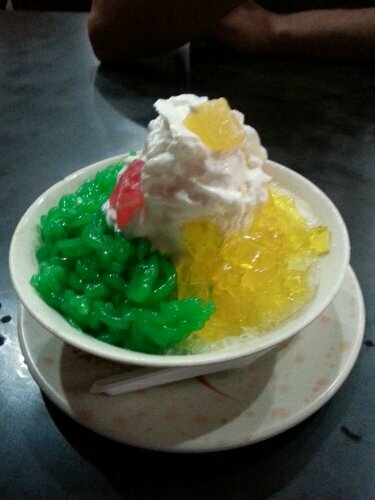 Sure, the jelly and ice cream sat on top of a big pile of shaved ice. And sure, the gummy lolly decorations were an odd inclusion. But hey, they were no vegetables in it! I gave it a try, and it was basically what you’d expect from the description. I wasn’t sure about the inclusion of ice at first, but it wasn’t half bad. It kept everything cold, although things did get a bit watery after a while. The lollies were super super chewy, and not the best. But they were easily avoided. And the cream coated icecream and jelly were both pretty good. It was not my favourite dessert (I’m pretty solidly in the chocolate/caramel/cookies camp when it comes to dessert), but I definitely think I came out on top of this one. I feel a bit sorry for The Engineer. He’s busy working through the week, and when it comes to Friday, the last thing on his mind is a challenge. I try to remind him that this is his chance to make me do some weird things, and to get me back for preserved egg week. But still, it seems to slip his mind. And last week it was made worse by the fact that I had a terrible cold from Wednesday to Saturday (we had to miss the Borneo Jazz Festival because of it, and I’m still a little bitter about it). On Friday he felt too bad to challenge me. I actually wanted him to. I thought that when I had a blocked nose was the PERFECT time to try something a little bit disgusting. But instead I slept, and he entertained himself setting up a new music thingy on the laptop (I’m usually fairly tech-savvy, but when it comes to organising music and iTunes and updating and syncing, I’m the opposite, and very happy to leave it up to him). Long story short, we got to Sunday, and still no challenge had been set. We had popped over to Malaysia (as you do) to get me a new desk chair, and he decided to visit a Malaysian supermarket to see what caught his eye. And what ended up catching his eye was the dried fruit candy aisle. 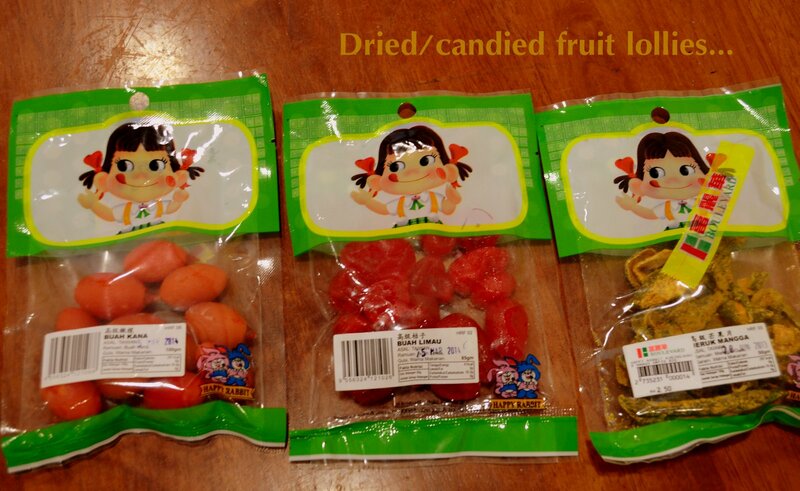 (I don’t really know what to call this, but in every Malaysian and Bruneian supermarket we’ve been to there’s a section that contains bags of brightly coloured dried fruits. The way they’re set up always makes me think of candy, and they’re definitely sugared, but they do all appear to be dried fruits). This was a section we hadn’t explored much, so he picked out a selection of the funkiest looking packets. 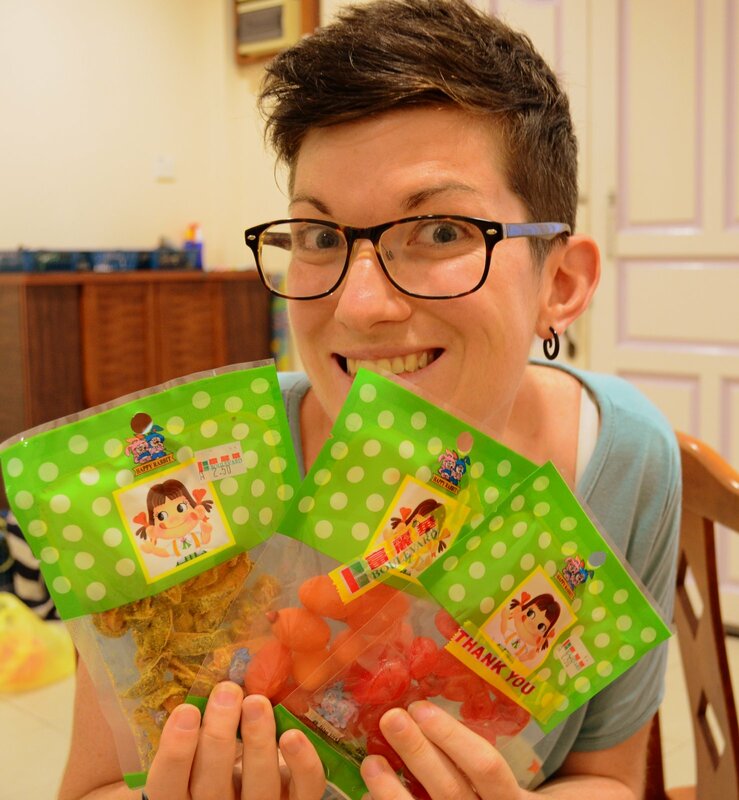 We ended up with a dried mango, something labelled Buah Limau (which Google Translate tells me is Citrus Fruit), and something labelled Buah Kana (on which Google Translate has nothing to offer). I definitely thought this was an easy one. 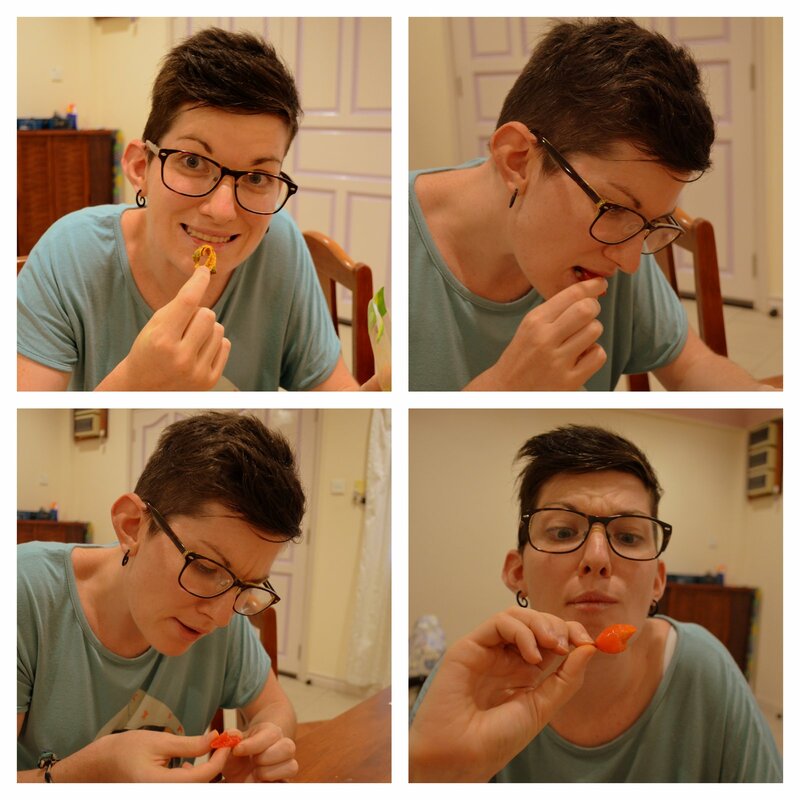 But that smile was quickly wiped off my face when I tried the dried mango. It was extremely dried, rough, and hard to chew. And the taste certainly wasn’t like mango. I don’t particularly like mango, but it would have been far preferable to the salty, sour, slightly fruity flavour of this snack. The combination of the flavour, and the texture, meant that after what felt like a minute of chewing, I could no longer handle it, and I spat it out. Yes, you read that right. I ate a Century Egg, but I spat out a piece of dried mango. The red one was next. And it was an improvement. Particularly in the texture. It was just like a dried apricot/whatever in texture. It looked a little bit like a strawberry, but I still don’t actually know what it was. The flavour was (once again) sour, salty, and sweet. I wouldn’t bother eating another piece of it, but this one stayed in my mouth. And last but not least was the orange one. Apparently citrus fruit, but I don’t believe it for a second. I grabbed this one, took a bite, and then made several different confused expressions (as evidenced in the photos below). The reason I was confused was the texture. It was hard. Like, really quite hard. And it had a massive stone in the middle. The texture wasn’t bad, but it was certainly surprising when I was expecting a piece of dried fruit, and possibly citrus fruit at that. The redeeming feature of this orange dude was the flavour. This one was actually kinda nice. I think it’s because it was missing the salty note that was so unusual in the first two. Don’t get me wrong, I love me some salty and sweet – peanut butter chocolate, kettle corn, etc. but salty + sweet + sour is quite strange for my palate (although quite common here). Me tasting the fruit. Missing: me spitting out the dried mango. And really, there isn’t much more to say than that. On my way to meet The Engineer for lunch. Our favourite spot is by the river, about 5 minutes walk from home. These things are enough to make it a favourite, but the real reason is the great cheap food. You’ve got to be careful when walking in KB. 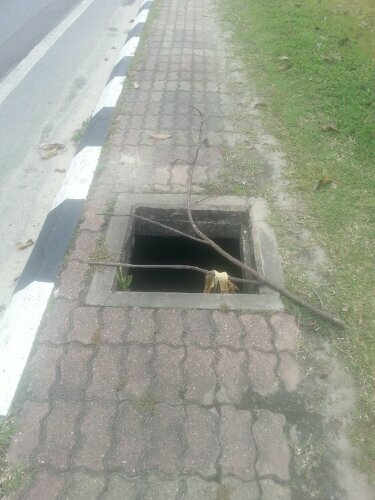 This hole in the ground leads to a storm drain. The stick is a welcome new addition – it actually warns you of its existence. And this isn’t really isolated either. There are huge storm drains and gutters all over the place filled with stinky water. 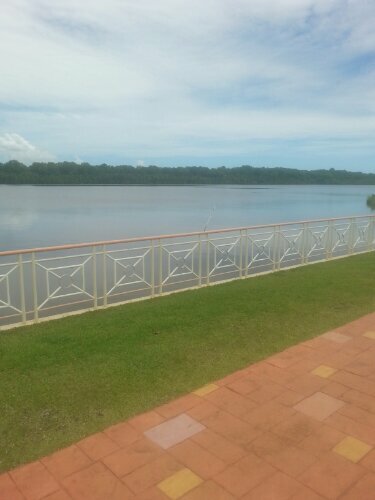 The Belait River is really rather attractive. We’re looking forward to The Engineer going on a speed boat course so that we can cruise up a bit further. This is “our” lunch spot. 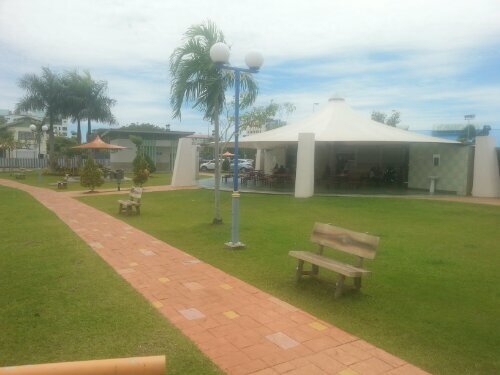 A little food court with two drinks stalls, and about 4 or 5 food stalls. It’s usually pretty busy, but we’re usually the only white people there. We get some funny looks. But we can get Laksa for $2, so we’re not going to stop going. A terrible shot of The Engineer and our lunch time view. 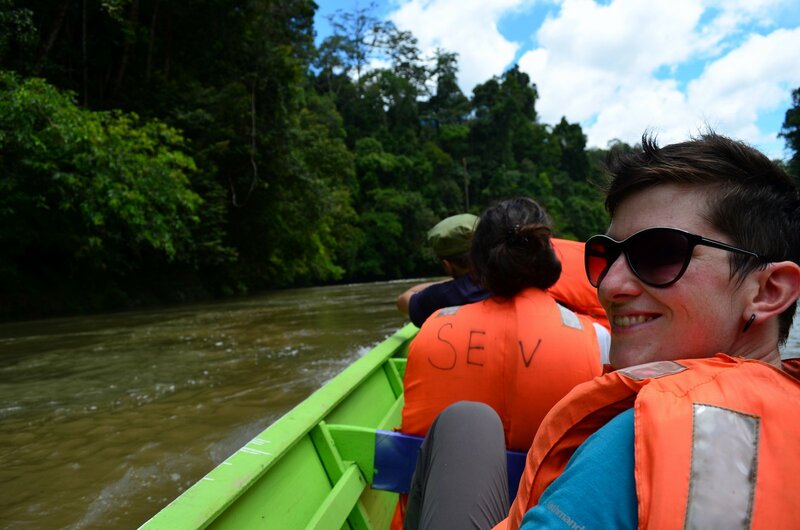 About two minutes after this picture was taken, a ship with an oil rig on it travelled up the river. Very impressive. 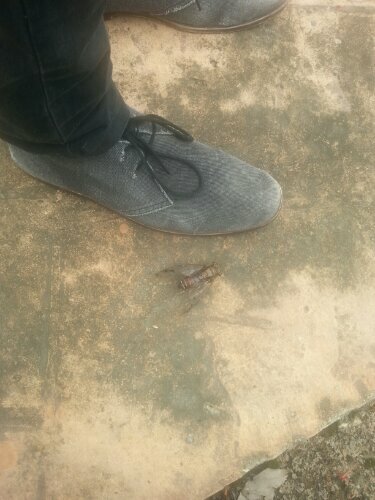 We spotted a giant dead cicada on our way out. There are some crazy large bugs over here. 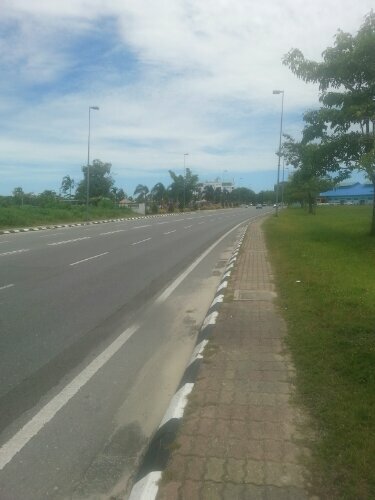 After lunch is apparently rush hour in KB. (Actually, it’s probably lunch for most – this was only about 12:40). It took ages to get across. We stopped in at the market on the way home for some veges and a phone top up card. We bought lady fingers, limes, eggplants, and onions. Total cost: $4.50. Also failed to take a picture of the actual stalls. And there it is. 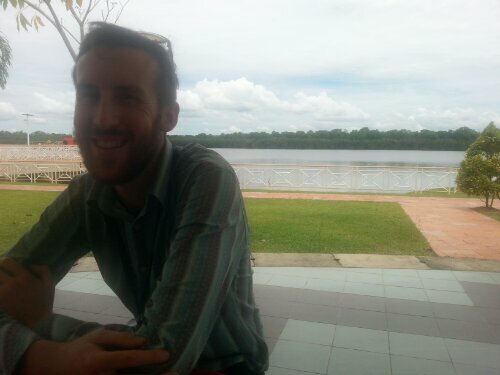 A (not very exciting) look into a typical lunchtime for us in Kuala Belait. The seventh in our weekly challenge series was a challenge I’d kept in mind for a while. I’d given a hint about it a couple of posts ago (when I tried the Grass Jelly), and I’d mentioned it on Facebook. I was quite excited about this one! But then I got a cold, and it’s taken a while to wade through all the snotty tissues and naps to actually write it. 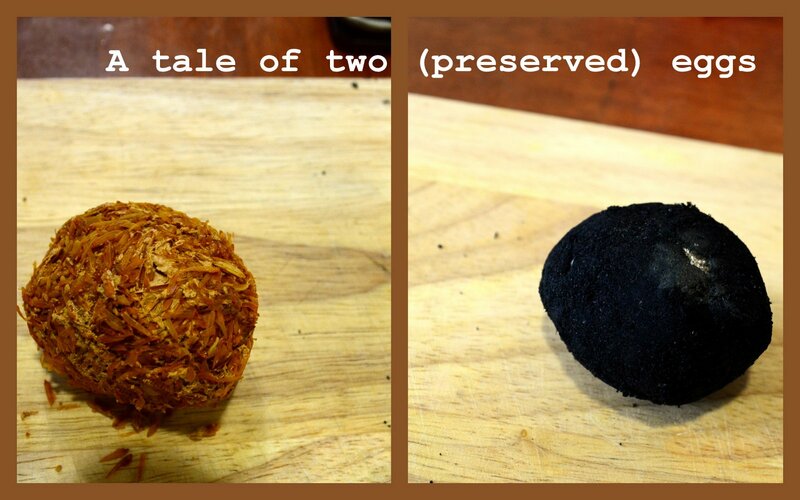 This post the tale of two preserved eggs, and the engineer who willingly ate them. We’d both heard of different kinds of preserved eggs before. But you don’t really see them around in New Zealand. Then we got here, and suddenly they were everywhere. Not on menus all that much, weirdly enough, but at plenty of supermarkets, mini-marts, mega-marts, and market stalls. So it was only natural that they went on the challenge list. Initially, the challenge was going to be just a Century Egg (the brown one above, preserved in some mad concoction for 100 days). But plans changed when we could only buy them in a four pack. We did not anticipate enjoyment (The Engineer got progressively more nervous the closer we got to the challenge), and didn’t want to be wasteful. We thought the market might allow us to buy just one. But when we got there, there were no Century Eggs to be seen. 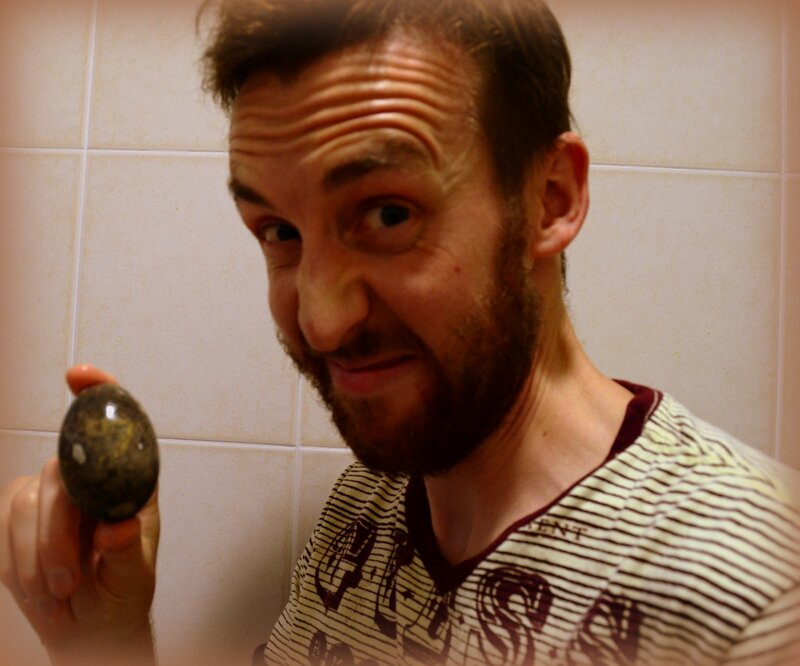 We did see the weird black eggs though, and decided to go for those. Despite my great requesting, and gesturing (“numbers are EASY” I thought), we did not get just one. We walked away with three of these, not quite certain as to what was inside. When we googled and discovered they were Salted Eggs, The Engineer was relieved, but I was disappointed. I decided that the challenge should be extended, and should include both Salted Eggs and Century Eggs (which we bought in a four pack, despite the wastefulness). I was intrigued. The Engineer was not impressed. This is what The Engineer thinks of this challenge. The first step was actually getting into the eggs (pretty easy). Then the Salted Egg needed to be cooked (again, pretty easy – just like boiling a regular egg). 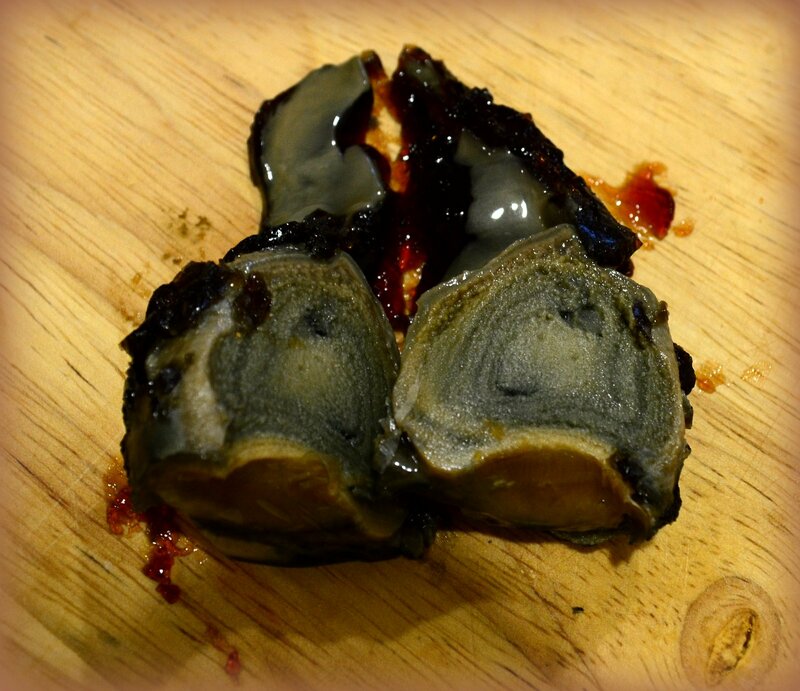 Our (very unusual) Century Egg. We did quickly check whether a preserved egg could be rotten. But when we didn’t find anything much, we decided to just go for it. (hint: we both survived, so it must have been okay). I laughed evilly. The Engineer laughed nervously. But eventually he got it together, and managed to eat a mouthful. The scowl and slightly nauseated look on his face said it all. But his verdict was actually that the taste was not too bad. “Why do you look like you’re about to spew then?” I asked. And as I got closer, I could see what he meant. Ammonia and sulphur rose up out of the grey yolk, and definitely did not smell like food. But when I took a very small nibble, I realised that he was right. The taste is actually not too bad. I didn’t want to eat more. But I also didn’t spit it out. I’ve been told that you don’t generally eat them alone, and that having them in porridge/congee is the way to go. And, to be honest, I’d consider giving it a go. Maybe if it was out of the shell for a bit, the smell would dissipate a little, and you’d just be left with the slightly interesting taste. 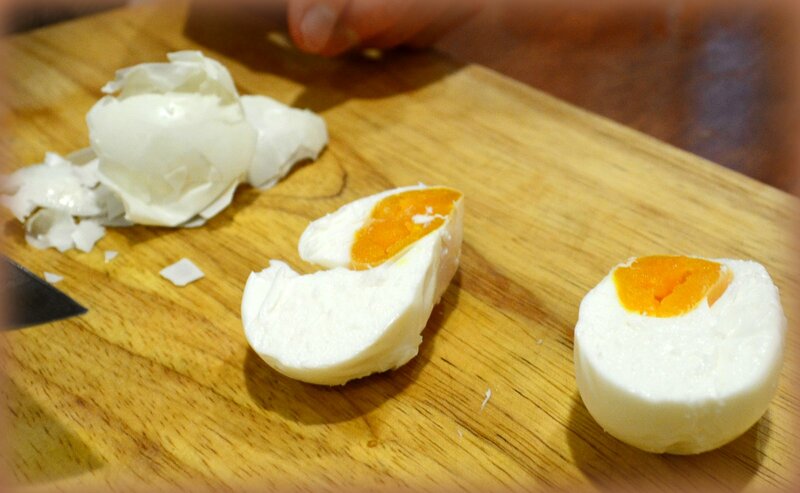 Then again, if you can eat a lovely fresh egg, why would you bother with one that seems kinda rotten? We tackled the Salted Egg second, partly because of the cooking time, and partly because we thought it was a bit less scary. And when we cut into it, we saw that we were right. In fact, it looked positively egg like. After the grey/brown sulphury mush of the last attempt, this was quite a relief. Salted Egg looks far more egg like. This one we both tasted at about the same time. The Engineer felt pretty cocky after managing the Century Egg. And I actually thought this one might be pretty good. I like salt. I like eggs. I like them together. Again, I suspect that eating it alone was a mistake. But also once again, I wonder why I would eat a preserved salted egg, when I could just have a regular egg with a little salt. The choice seems kinda obvious. 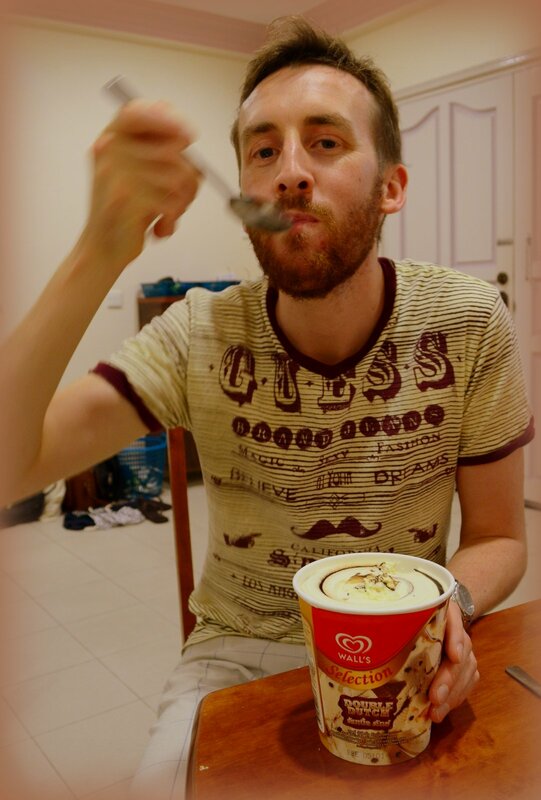 The best of times… Ice cream! 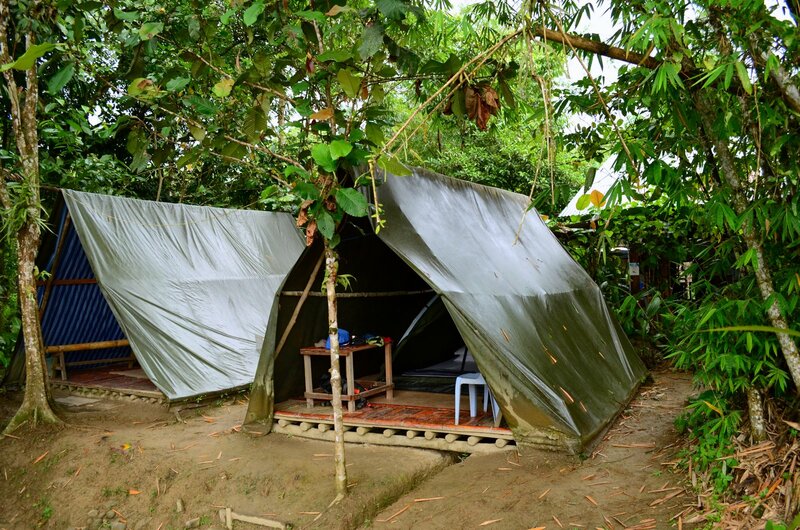 When we first thought about moving to Brunei, I wanted information. And lots of it. And being me, I first turned to my good friend Google. 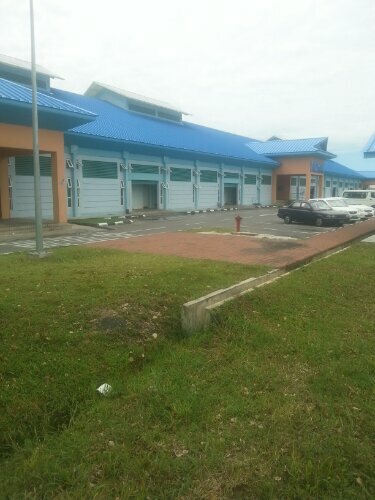 I couldn’t even tell you how long I spent searching for ‘expat life kuala belait’, ‘what to do in kuala belait’ ‘expat brunei blog’, and various other combinations of the words expat, kuala belait, brunei, information, blog, along with specifics like restaurants, spa, tailors, supermarket. I didn’t expect to truly understand what it might be like, but I wanted to know a little bit to prepare me. Brunei is not big on websites, but they are big on Facebook. So yesterday, when The Engineer told me that he was having trouble finding up to date information on the Boat Club (we want to hire a powerboat for a river trip) I told him I’d try and find something this morning. I had some printed information from when we first signed up, and didn’t want him to get too distracted from his work. I read, and I searched. And then I stumbled on the goldmine, and sent a link through to him. This week’s challenge was a little different to most of our others. It’s not trying something that we think sounds weird or will taste bad. It’s just something that we’ve never done before, but is very common here. Which is really the point of this series. So this one will probably sound pretty easy to many of you. 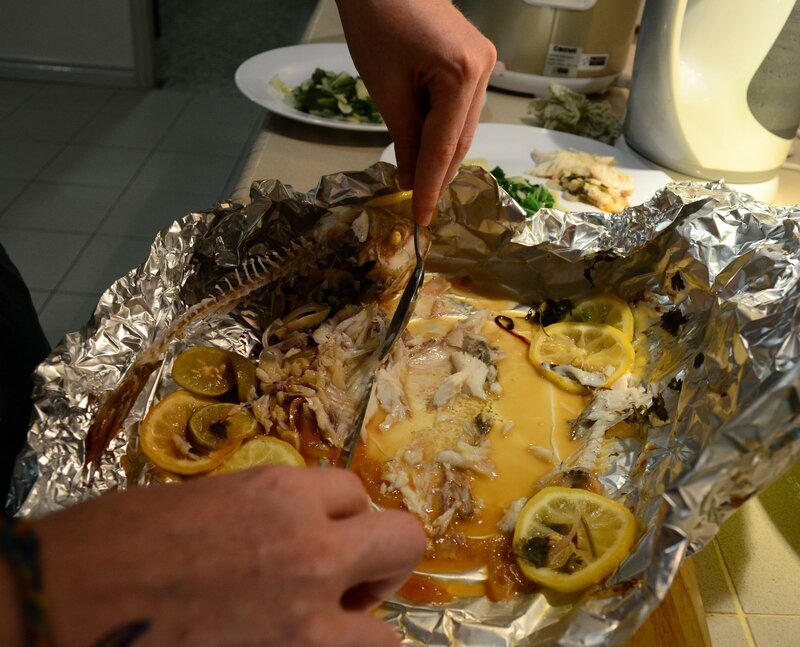 The challenge was to buy and cook a whole fish. Both of us have led rather sheltered lives, and we’ve always had our fish filleted. 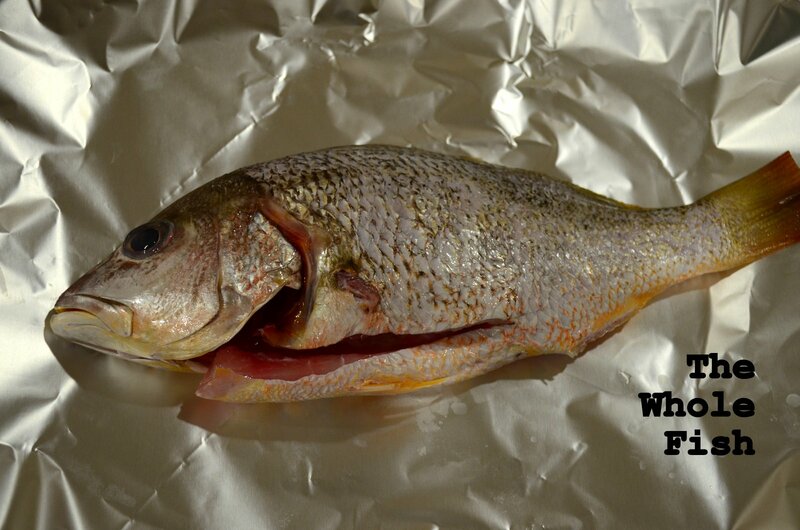 Sometimes by The Engineer’s Dad, who’s pretty nifty with a filleting knife. More often than not by someone at the supermarket/fish shop before we even see it. But here, that’s not really an option. You can buy it whole, or not at all. We tackled the challenge on Saturday morning. We were wandering back from a lazy breakfast at Marilyn’s Cafe, and our route took us right past the market. The stalls outside were only just getting going, but we knew that there should be some fish stalls open inside. ‘Should we head in now and see what they’ve got?’ I asked The Engineer, and we made a slight detour. There were only a few stalls open in the big blue building, so we wandered around fairly quickly. When I saw the crabs crawling around in their cages, I was tempted to change the challenge, but we saved that one for later, and found a stall selling some nice looking fish, which the young man running the stall told us were Snapper. We were not completely convinced, but it looked nice and fresh so we picked one out anyway. ‘I clean?’ we were relieved to hear, and nodded. One less challenge for us! A couple of minutes later, we were $5 poorer, and had our wee fish in a plastic bag. On the way out, we stopped at some vegetable stalls, to grab lemons, limes, and coriander for the fish, and at the mini mart for some aluminium foil. We had big plans for this bad boy. And that was the hard part of the challenge over. Not very hard after all. Now we just had the fun part! That evening, we grabbed our supplies, and got working. First up, we gave it another quick clean, patted it dry, and laid it out on our foil. 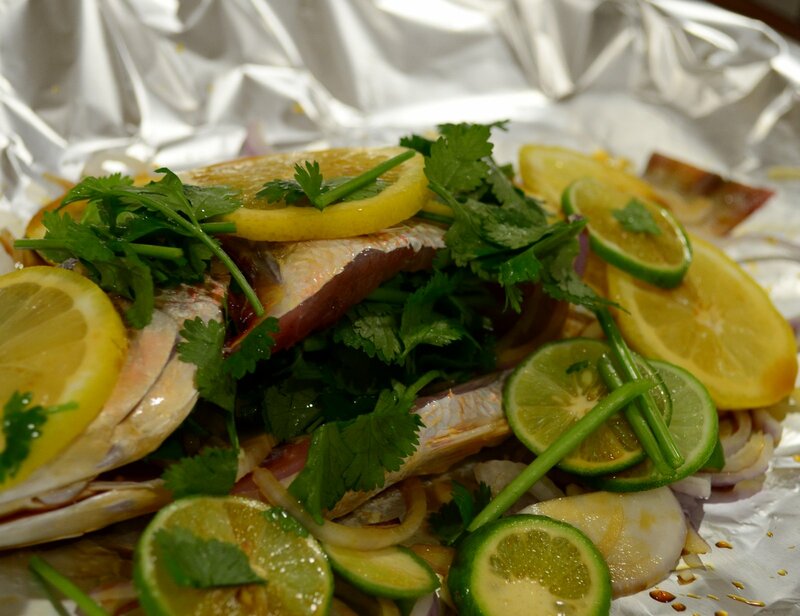 We rubbed it with ghee, stuffed it with coriander, piled it up with lemon and lime slices, and added a little soy sauce. It looked amazing. We popped it in the oven, and waited. 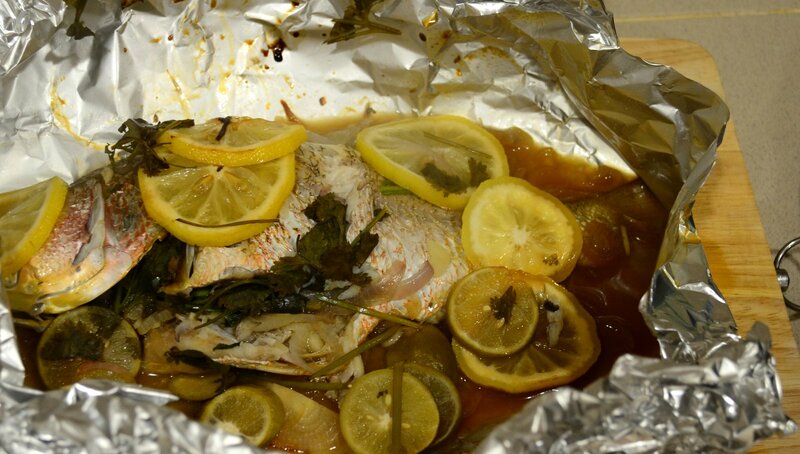 Forty minutes later, we pulled out the parcel, and opened it to release the delicious tangy steam, and reveal the perfectly cooked fish. Serving it was another slight challenge. My fish anatomy is terrible (their spine runs down the middle? ), but a quick google search soon revealed a nice easy method. We only missed a few little bones, which I think is pretty good for a first attempt. “Carving”/serving the fish. The photo’s probably a bit late to really show the process, but that’s all we’ve got. And then? All that was left to do was eat! We served our soy/lime/coriander fish with rice, and pak chye. As you can tell, I was pretty happy with it. And that was before I ate it. The smile only grew later on. The lesson that this challenge taught us is that things that sometimes seem a bit scary are usually really not. I don’t quite know what had been stopping us from buying whole fish (well, for the last few weeks it was that it was on our challenge list, but not yet at the top, but before that it was just a weird worry of ours). And I regret not doing it earlier! 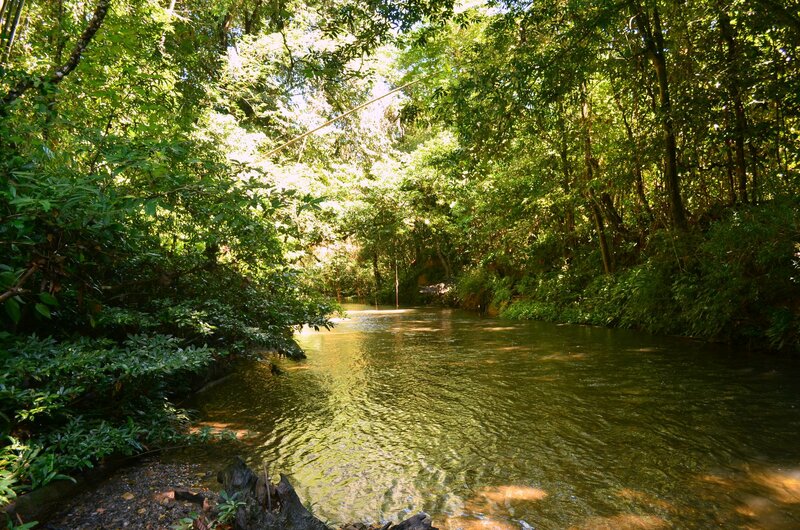 We have this great resource JUST down the street from our house, and we could have been making the most of it. At least we know now. And on those days when we haven’t got anything out for dinner, we’ve got a quick and easy solution! Next time we might even extend ourselves and attempt to fillet one. I suspect that could be messy though! Maybe best to leave that until we have our resident expert filleter here in June.